REUTERS: Russia threatened economic retaliation against Turkey on Thursday and said it was still awaiting a reasonable explanation for the shooting down of its warplane, but Turkey dismissed the threats as "emotional" and "unfitting." In an escalating war of words, President Tayyip Erdogan responded to Russian accusations that Turkey has been buying oil and gas from Islamic State in Syria by accusing Syrian President Bashar al-Assad and his backers, which include Moscow, of being the real source of the group's financial and military power. The shooting down of the jet by the Turkish air force on Tuesday was one of the most serious clashes between a NATO member and Russia, and further complicated international efforts to battle Islamic State militants. World leaders have urged both sides to avoid escalation. In an apparent attempt to cool the dispute - and appeal to Western countries - Turkish Prime Minister Ahmet Davutoglu said in a letter to Britain's Times newspaper that Ankara would work with its allies and Russia to "calm tensions". Earlier, Russian Prime Minister Dmitry Medvedev ordered his government to draw up measures that would include freezing some joint investment projects and restricting food imports from Turkey. Economy Minister Alexei Ulyukayev said Moscow could put limits on flights to and from Turkey, halt preparations for a joint free trade zone, and restrict high-profile projects including the Turk Stream gas pipeline and a $20 billion nuclear power plant Russia is building in Turkey. Russia's defense ministry meanwhile said it had suspended all cooperation with the Turkish military, including a hotline set up to share information on Russian air strikes in Syria, the TASS news agency reported. "We are strategic partners ... 'Joint projects may be halted, ties could be cut'? Are such approaches fitting for politicians?," Erdogan said in a speech in Ankara. "First the politicians and our militaries should sit down and talk about where errors were made and then focus on overcoming those errors on both sides. But instead, if we make emotional statements like this, that wouldn't be right." Kremlin spokesman Dmitry Peskov said Russia was still awaiting a reasonable answer from Ankara on why it downed the fighter jet. Moscow insists it never left Syrian air space, but Ankara says it crossed the border despite repeated warnings. The Turkish foreign ministry said diplomatic missions and Turkish business interests in Russia had come under attack and said Russia's ambassador in Ankara had been summoned in protest. Erdogan said the Russian jet was shot down as an "automatic reaction" to the violation of Turkish air space, in line with standing orders given to the military. Those instructions were a separate issue to disagreements with Russia over Syria policy, he said, adding Ankara would continue to support moderate rebels in Syria and Turkmen fighters battling President Assad's forces. Erdogan told that Russia, not Turkey, should be the one to apologize for the incident. And in an interview with France 24, he said he had called Putin after the jet was shot down but that the Russian leader had not yet called him back. Medvedev on Wednesday alleged that Turkish officials were benefiting from Islamic State oil sales, while Russian Foreign Minister Sergei Lavrov said it was no secret that "terrorists" use Turkish territory. "Shame on you. It's clear where Turkey buys its oil and gas ... Those who claim we are buying oil from Daesh like this must prove their claims. 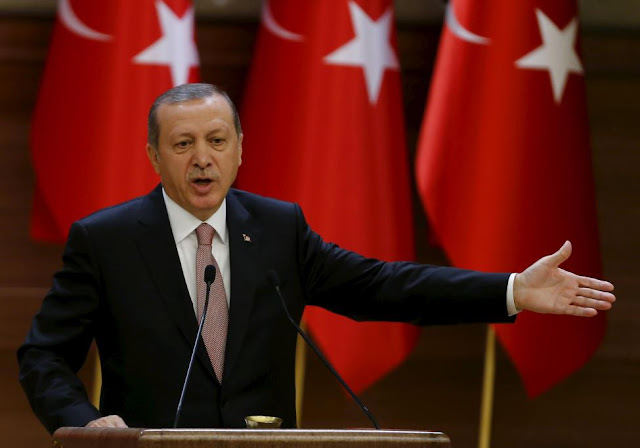 Nobody can slander this country," Erdogan said, using an Arabic acronym for Islamic State. "If you are seeking the source of weaponry and financial power of Daesh, the first place to look is the Assad regime and countries that act with it," he said. Moscow says its military involvement in Syria is aimed at battling terrorist groups including Islamic State, casting the campaign to a supportive Russian public as a moral crusade that must be completed despite obstruction from elsewhere. Turkey and its allies say Russia's real aim is to prop up its ally Assad and that it has been bombing moderate opposition groups in areas of Syria like Latakia, where the jet was downed, and where there is little or no Islamic State presence. Russian forces have shown no sign of backing down, launching a heavy bombardment against insurgent-held areas in Latakia on Wednesday, near where the jet crashed. A Reuters correspondent on the Turkish side of the border saw rockets and tank shells being fired from government-controlled western Latakia eastwards into rebel-held territory, sending plumes of smoke rising from the wooded hillsides. Turkey's action infuriated Russia, but Moscow's response has been carefully calibrated. There is little sign it wants a military escalation, or to jeopardize its main objective in the region: to rally international support for its view on how the conflict in Syria should be resolved. But it clearly wants to punish Turkey economically. The head of Russia's tourism agency, Rostourism, said cooperation with Turkey would "obviously" be halted. At least two large Russian tour operators had already said they would stop selling packages to Turkey after Russian officials advised holidaymakers against traveling to its resorts. Russians are second only to Germans in terms of the numbers visiting Turkey, bringing in an estimated $4 billion a year in tourism revenues, which Turkey needs to help fund its gaping current account deficit. Medvedev meanwhile said Russia may impose restrictions on food imports within days, having already increased checks of Turkish agriculture products, its first public move to curb trade. Moscow banned most Western food imports in 2014 when Western countries imposed sanctions on Russia over its role in the Ukraine crisis, leading to supply disruptions as retailers had to find new suppliers and galloping inflation. The row has also put a brake on new wheat deals between Russia, one of the world's largest wheat exporters, and Turkey, the largest buyer of Russian wheat.